Football has earned a spot as the dominant sport on the American sporting scene, as Super Bowls broadcasts routinely crack 100 million viewers in the U.S. alone. The average football game is scheduled to last, in terms of broadcast time, three hours. The actual play in the game, though, is dramatically less than that. Football fans know a regulation league game lasts 60 minutes. The game is divided into four 15-minute quarters. At the end of the first and third quarters, there is a three-minute break. A 15-minute break follows the first half. If a game is tied at the end of regulation, the teams will play one sudden-death period of 15 minutes. The team that scores first wins the game. If neither team scores in the extra period, the game ends as a tie. Postseason games cannot end in ties. If neither team scores in the first overtime period, the game continues until the game ends as a result of a touchdown, field goal or safety. 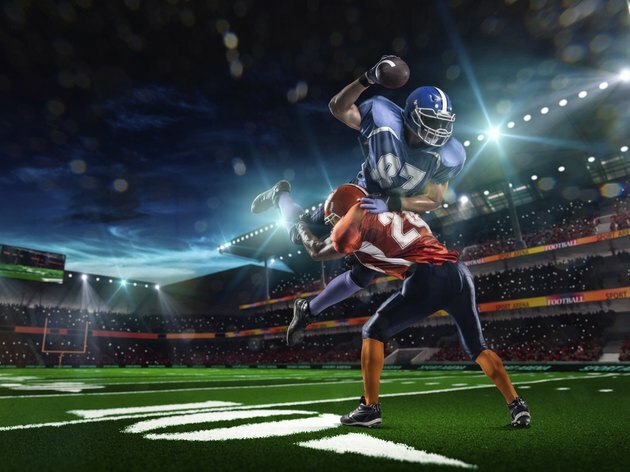 The average play in a football game can last anywhere between four and 12 seconds. A play starts when the center snaps the ball to the quarterback or another player in the backfield. The play ends when a player is tackled, runs out of bounds or a pass falls incomplete. When the total of all these plays are added up in a regulation professional football game, the total length of the time played is approximately 11 minutes, according to a 2010 report in "The Wall Street Journal." This total has remained consistent over the many decades pro football has been played. An Indiana University professor recorded 13 minutes and 16 seconds worth of action in a 1912 game, and that the Pro Football Researchers Association recorded an average of 13 minutes and 30 seconds worth of action from games that the organization had studied. One reason for the drop-off in the amount of time actually played is the rules of the game. In football, a player who is tackled within the field after running with the ball or making a catch ends the play. The clock continues to move. The team must put the ball back into play within 35 seconds after the play clock is started. As time rolls after tackles are made, players are running back to the huddle, getting the play call and then setting up for the next play. The clock stops on an incomplete pass or when a runner goes out of bounds, but as soon as the referee puts the ball back on the line of scrimmage and rules that it has been readied for play, the clock begins to count down again. While the actual playing time has remained relatively the same over the years, the actual time from the start of the game to the finish has increased dramatically. The use of timeouts by each team, injury time, replay time and commercial time has lengthened games significantly. The average television broadcast will show as many as 100 replays during an individual broadcast. Football broadcasts can last almost four hours when a game goes into overtime or for special broadcasts, including the Super Bowl.